Reliance My Gold Plan Review - Should you Invest? 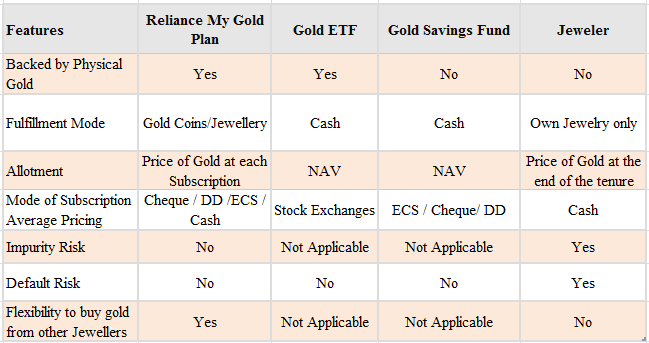 Home » Gold » Reliance My Gold Plan Review – Should you Invest? You may have heard about various gold investment plans of jewelers like TBZ, Tanishq, Titan where you need to invest money in small amount and final delivery is in terms of Gold Jewlellery. Reliance has launched similar type of plan few days back. Name of plan is Reliance My Gold Plan (RMGP). With this plan Reliance Money targets Rs 2 Trillion unorganized gold market news posted in Time of India. Let’s Review Reliance My Gold Plan to find out is it worth investing in this plan. Resident individuals including minors,HUFs and NRI. The minimum monthly subscription amount which the customer has to commit at the time of registration shall be Rs. 1000/- and in multiples of Rs. 100/- thereafter. The various tenures available under the Plan are 1 year to 15 years with interval of 1 year. 6 months from the date of initial subscription. Fulfillment of Gold Grams shall not be permitted during the Lock-in period. No pre-mature termination fee on fulfillment post 1 year from the date of creation of Customer ID. Fulfillment during the lock-in period is not allowed. However, a pre-mature termination fee of 2.5% shall apply on the cumulative subscription amount paid by the customer in case of pre-mature fulfillment post lock-in period but before 1 year. Safe Keeping Charges of 0.5% per annum on the total subscription amount. The charge is applicable only in case the customer does not take delivery of Gold Coins within 60 days from the date of issue of Fulfillment Voucher or the date of completion of chosen tenure whichever is earlier. RMGP scores high over the traditional gold accumulation plans offered by jewelers in terms of assured purity and creditability. It also offers more flexible options of converting into physical gold while other schemes of jeweler force that jewelry has to be bought from the same outlet on maturity. Although RGMP gives benefit of averaging cost and give protection against volatility in gold price same benefit can be obtain by doing SIP in Gold ETF. According to me RGMP is option to accumulate gold and not gold investment option, as it does not have the option of redeeming the maturity proceeds as cash. One should not invest in this plan. This is not correct plan for Gold investment. If the primary objective is to diversify the investment portfolio by investing in gold, gold ETF is much better option than RMGP. I have Rs. 5000 per month for 5 years invested in RMGP. Am I at a risk if Gold price reduces after 5 years. Gold Price will not reduce after 5 years. Gold will remain bullish for long term. In gold ETF “impurity risk” is NA, what does that mean? Also after taking out gold in the RMGP when the plan fulfills we can just sell the gold, get the money and put it in or account? In gold ETF “impurity risk” is not applicable because gold ETF is in demat form and not in physical form(gold) hence impurity risk is not applicable. 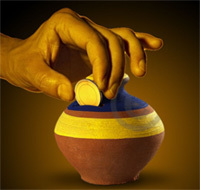 Yes, In RGMP once plan is fulfils you will get gold coin which you can sell and get money to put it in account. Jweler can sell jwellery which is likely to be impure 22 karat but in RMGP it will be 24 karat 99.5% pure. Can you explain what does “Impurity Risk” covers which is No in RMGP and Yes in Jwelers?